Music giants Jack DeJohnette, Larry Grenadier, John Medeski, and John Scofield, join forces in the electrifying new jazz-meets-rock supergroup, Hudson. Inspired by the beauty and spirit of their home region, New York’s Hudson River Valley, these famed improvisers bring fresh dimensions to Woodstock associated classics by Bob Dylan, Joni Mitchell, Jimi Hendrix and The Band and as well as compelling original compositions. The music also celebrates NEA Jazzmaster Jack DeJohnette’s 75th birthday. New Jazz meets Rock Supergroup honors The Hudson Valley’s creative spirit, inspiring original music and creative takes on Bob Dylan, Joni Mitchell, Jimi Hendrix and The Band. New York’s idyllic Hudson River Valley has been a rich source of inspiration for many millennia, from its rich sacred and artistic native American heritage, to the rise of the 19th century Hudson River School (America’s first recognizable non-native school of art) to the folk and rock movement that led to the era-defining Woodstock Festival of 1969, to Pete Seeger’s Clearwater movement and the burgeoning locavore movement with its craft wineries, breweries and wide spread indie arts and craft scene the area is home to more artists per-capita than any other area in the country, including New York City. Now, the next chapter in that remarkable history arrives in the form of Hudson, an awe- inspiring new collective that brings together four of the world’s most influential jazz musicians who are writing a new chapter in the marriage of jazz and rock which began with Miles Davis in the 1970s. 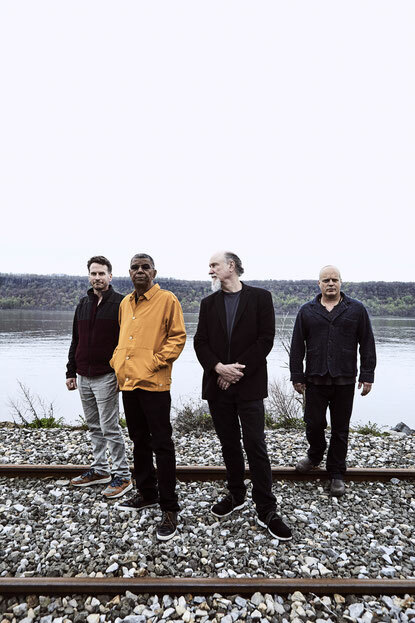 On their own, drummer Jack DeJohnette, bassist Larry Grenadier, keyboardist/organist John Medeski and guitarist John Scofield can each boast careers that are stunning in their diversity and reach, building impressive audiences across a wide range of genres and styles from jazz to rock and beyond. Together they comprise the rare supergroup worthy of the name. What’s brought them together is not just their similarly adventurous and virtuosic music, but a shared love for the scenery and spirit of the Hudson River Valley, which all four call home. The group’s extraordinary self-titled debut, Hudson (out June 9 via Motéma Music), strikingly captures the atmosphere and beauty of the region while celebrating the extraordinary music that has emerged from it. Mixing original music with thrilling renditions of world-famous songs by the likes of Bob Dylan, Joni Mitchell, Jimi Hendrix and The Band’s Robbie Robertson, Hudson has created an album as spectacular and breathtaking as the Hudson Valley itself. Standards ensemble. Guitar-master Scofield, equally adept at soulful jazz and R&B has recorded four albums with Medeski Martin & Wood, the trio known for melding the jazz and jam band worlds, while Grenadier has played with all three in different contexts. Adding to the fun, they spend this year celebrating the 75th birthday of NEA Jazz Master and GRAMMY®-winner DeJohnette. Hudson conjures that spirit in a variety of stirring ways, from the blues-reggae feel of Dylan’s “Lay Lady Lay” to the meditative vibe of Mitchell’s “Woodstock” to the New Orleans swing of The Band’s “Up On Cripple Creek.” Hudson’s originals cover territory including the electric abstract organic funk of their collectively improvised namesake track, the simmering, Latin-accented groove of Sco’s “El Swing,” and the defiant “Dirty Ground,” featuring DeJohnette’s moving, earthy vocals. The closer, “Great Spirit Peace Chant,” pays tribute to the Native American tribes that were the first to settle the area, with the whole band joining in with chants, percussion and wood flutes. Pastoral yet exhilarating, gorgeous yet thrilling, historic yet intimate, serene yet inspiring: these are the elements that make the Hudson Valley an ideal destination and Hudson a landmark recording.